Since early 2018, the Comfort Inn & Suites St-Jérôme offers its customers several new features, including 13 new rooms added to the existing 85. Breakfast, which is still included in the pricing, is now served in a more spacious area. In addi­tion to the existing unlimited Wi-Fi service, exercise room, and outdoor spa and sauna, they have added a new indoor pool to better serve business clients and family getaways. Two meeting rooms and banquet halls that can accommo­date more than 100 people complete the new facilities. The Gîte des Clos offers accommodations and breakfast in a comfortable, friendly, relaxed atmosphere. This new Bed and breakfast is a smoke-free environment with free Wi-Fi and no carpets in the rooms. Located only one hour from Montréal, Chalets Spa Nature of­fers luxury chalets located close to many activities. Go on cross-country skiing, snowshoeing or downhill skiing excursions, or quietly relax in front of a beautiful fireplace or in a hot tub. You will have an unforgettable stay in the warm, comfortable and tastefully decorated accommodations at Chalets Spa Nature. The dining room at Hôtel & Spa Mont-Gabriel has undergone a makeover! With new rustic tables, modern chairs, stylish decor, and a new chef and menu, Restaurant L’Ambroisie has what it takes to provide you with a distinctive culinary experience at the top of the Laurentians. Visit Hôtel & Spa Mont-Gabriel. Estérel Resort recently finished redecorating the restaurant Bistro à Champlain and resto-bar-terrasse 260. It has a new look and a redesigned buffet station with improved ergono­mics. In addition, for your groups, the Bistro à Champlain’s wine cellar can now accommodate up to 50 people for a tas­ting. Also, they have added two new meeting rooms, for a total of 12 rooms: the Salle du Lac, with a 16-person capacity, is located at lake level and has an adjoining patio for breaks, and the light-filled Salle des Hauteurs, which has leather armchairs for 12 people. A new yurt supplements the amenities offered by the 4-star Base de plein air Bon Départ. On a 539-acre site with access to five lakes and many kilometers of hiking trails in the woods, visiting groups have a choice between several types of accom­modations according to their needs: yurts, cabins, an inn and recreational dormitories. 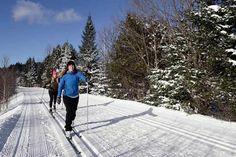 Many activities are seasonal: fitness trails, kayaking, archery, rock climbing, fishing, cross-country skiing and snowshoeing. Since last winter, a covered ice rink was installed for hockey and broomball. Auberge Aux Nuits de Rêve sets itself apart yet again! Trip Advisor ranked it 3rd out of 25 hotels for lovers in Canada in 2018. In addition, a fourth spa has been added for guests to use privately. The Auberge is a haven of peace designed to create intimacy for couples seeking serenity in unique, award-winning, highly sought-after accommodations. The truly unique suites and rooms allow guests to recharge while experiencing the inn’s tasteful thematic setting. Visit Auberge Aux Nuits de Rêves. The two newest renovation projects answer to the needs and desires of todays vacationers looking for the ultimate relaxing getaway. Chalet units 43 and 44 each come equip­ped with a private double whirlpool, a sauna, a wood bur­ning fireplace and a fully equipped kitchen all overlooking the lake and private beach. Next door vacationers can enjoy a shared hot tub as well as the recently constructed fitness centre Le Soleil. Amenities include an indoor pool, a 10 seat hot tub with light therapy, a gym and a steam room. Visit Chalets Lac à la Truite. The walls of the common areas, spa and 30 suites now have a new tapestry. A touch of blue has been added behind the majestic king beds in each of the suites to give some punch to the overall look. A new chef, Sylvio Alonso, a native of France who has recently settled in Québec, is now at the helm of Restaurant La Quintessence. He has worked in various 5-star es­tablishments and Relais & Châteaux in France, including a res­taurant in Gargas with a star from Michelin. He advocates herbs and eco-friendly food, and brings his personal experience to the dishes he prepares for the Restaurant La Quintessence’s various menus. Visit Hôtel Quintessence. Established in 2015, this convivial lodge is perfect for nature lovers and sports enthusiasts of all generations. In addition to staying in comfortable, tastefully decorated rooms that are fully self-sufficient, Le Nomade’s guests enjoy preferential rates for restaurants, golf courses and activities. 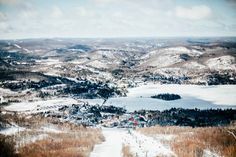 Le Nomade is located between the Tremblant pedestrian vil­lage and Mont-Tremblant National Park. Visit Le Nomade Mont-Tremblant. A leader in family camping, this campground in Labelle has added brand new water features that will make their cam­pers happy! Come and have fun in this new aquatic area, right next to the heated pool. 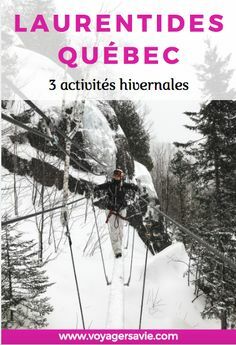 Rediscover the large children’s playground, inflatable game, trampoline and pleasures of the beautiful Rivière Rouge. Enjoy the beach, and canoe and kayak excursions. Just minutes away from the bike path and services, it’s guaranteed to be an unforgettable family vaca­tion! Cottages and ready-to-camp tents are also available for rent. Visit Camping Chutes-aux-Iroquois. Chalets Rapide des Cèdres is proud to host you year-round in the Yourte aux Huards on the banks of the Poisson BlancReservoir, where fishing, canoeing and swimming await you. Two rustic cabins as well as 4-star cottages are also available. Come and enjoy this large property to go hiking, cross-country skiing, Hok skiing and ice fishing. In addition to their treehouse, Hobbit house, chalet-teepee and yurt straight out of Mongolia, this Nominingue busi­ness will offer the Enchanted Treehouse this spring. 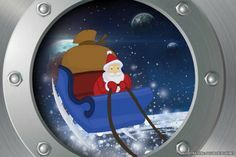 It is en­chanted because it comes right out of an imaginary universe where nothing is straight! The walls lean, the roof is curved, the windows are crooked, and much more. Accessible by a suspended walkway, this treehouse, located more than 20 feet above the ground, will charm you with its colours and magical atmosphere. Visit Les Toits du Monde. Le Domaine Lausanne is continuing its experiment withglamping by diversifying its read-to-camp offer yet again! This year, the campground is innovating by introducing ano­ther 43 ready-to-camp units. There is something new for all tastes, with five types of experience on offer: 2 Cosybubbles,10 Boréale tents, 10 trailers, 13 cabins and 10 floating cabins. Côté Nord Tremblant: truly a little corner of paradise!